The Force Is Strong With This Robe | OhGizmo! By Chris Scott Barr on 09/28/09 • Leave a comment! I’m a guy that likes to grab a robe and wear it when I first get up, or sometimes when I get out of the shower. They’re comfortable, and allow you to walk around pants-free without displaying your underwear to everyone. My robe is rather dull looking, as it’s just plain gray with a belt. If you’re looking for something a little more geeky to walk around in first thing in the morning, look no further than this Jedi Dressing Gown. This awesome homage to the defenders of the Star Wars universe will not make you one with the Force. It will however keep you nice and comfortable in its cotton velour fabrics. 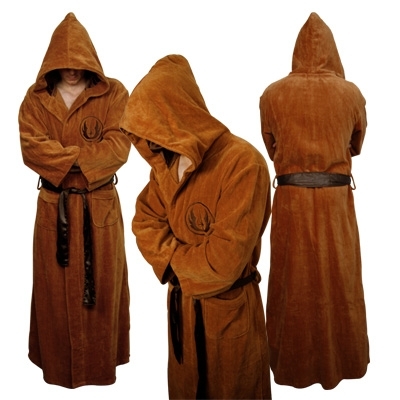 The robe is designed to look like something your average Jedi might wear until he’s had his his morning cup of Joe. The hood and Jedi insignia definitely complete the look. It is currently available for pre-order, and will ship on November 27th for $96.